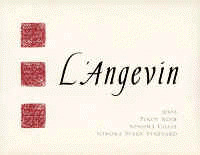 The concept for L'Angevin Wines is to seek out mature vineyards in cool climates and combine them with diligent vineyard care and classical winemaking techniques. 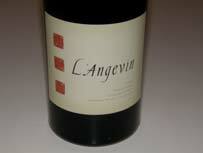 L'Angevin began as a joint venture between Alan Peirson and Robbie Meyer who met at Peter Michael Winery where Robbie was the enologist and assistant winemaker, and Alan was the estate/project manager. Joining the venture in 2002, making L'Angevin an entirely family business are Lesley Warner-Peirson and Shannon Meyer. With the 2007 vintage, the winery has a companion label, Peirson Meyer, along with a newly designed very stylish label. The L'Angevin Pinot Noir is a Russian River Valley appellation blend which I find a bit jammy with plenty of oak, but the Chardonnays are first rate including a Russian River Valley and Laughlin Vineyard bottling. The wines are sold primarily through a mailing list with some retail distribution. Tasting is available in Yountville at Ma(i)sonry.